Before I dive into the world of remote lens control systems, let me state for the record: I am not a professional 1st AC (focus puller), I’m a professional MōVI operator and cinematographer. I work with lens control systems on every single MōVI job I work on and I have a great deal of experience rigging and setting up the most common systems (I say “most common” because new systems are popping up all over the place these days). I rarely pull focus myself. I do however, work with a lot of different 1st AC’s and ask for feedback on lens control systems constantly, so while I can’t speak to the nuances of the systems while shooting first-hand, I do have a lot of information on the matter. And when it comes to rigging your lens control system for your gimbal, the reliability of the system, ease of use, quality and consistency of lens calibration, using multiple channels (multi-axis), etc., I have enough information to bore even the most enthusiastic technophile and have been known to do so on many occasions. Simply put, the quickest way to ruin a scene is to ruin the focus. You need to do everything in your power to make poor focus NOT YOUR FAULT. No one likes negativity on set, especially when it comes to people blaming each other for a ruined scene, so I hate to even bring up the idea of “fault” or “blame”. But even on the most positive set, if your gear is causing problems, you will be responsible for fixing it and if it’s un-fixable because your gear is just not able to perform adequately, you will probably not hear “MōVI is up” on that shoot ever again. So do yourself and your 1st AC a huge favor – buy a remote lens control system that will get the job done right 100% of the time. Preaching is complete, moving on. The 1st AC makes his witness marks on a Redrock MicroRemote wireless handheld controller. 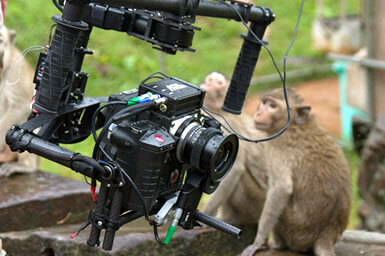 The Hocus Axis 1 remote lens control system, shooting in Angkor Wat, Cambodia with the BBC. Rain, humidity, mischeivous monkeys – no match for this durable system. • ACCURACY: Every time the focus puller moves the control wheel to a witness mark, whether pulling focus in or throwing focus out, it should match the mark on the lens, every single time. • SPEED: Some lenses have smooth focus and iris rings, some have sticky ones, especially older lenses. Your system’s motor(s) should have enough torque and power to move every lens in the set in real time as though you were physically turning the lens ring with your hand on the lens itself. • RANGE: If the signal is lost between your system’s transmitter (tx) and receiver (rx), the system is useless. Do not trust what your system’s spec sheet says, as the manufacturer has most likely listed a best case scenario range which you will probably never experience. Recruit a friend to help you range test your system before your shoot in all the different scenarios you may encounter on your shoot. Test in a crowded downtown area where cell phone towers and radio signals fill the air, test near water where signals erratically bounce around, test through different types of walls – brick, cement, sheet rock, etc. Test the system while all your other wireless systems are powered up, especially your wireless video system. Know your system’s range weaknesses and strengths so that when you’re on set, you have a fighting chance to keep the system going strong the entire time your camera rolls. • CONSISTENCY: This is tougher to predict, as electronics of all types, quality and caliber do fail from time to time. This is the exact reason why most 1st AC’s are very loyal to one brand of remote lens control system – they stick with what has worked for them and their peers the most reliably in the past. I’ll talk more about brands in just a bit. • SIZE / WEIGHT: In the gimbal world, every bit of weight on your rig counts, especially on those long one shot shoots that so many directors ask us for. The Freefly MōVI M15 accommodates quite a bit of weight and much larger cameras and lenses than its predecessor the MōVI M10, but it still has its limits when it comes to how much camera kit you can cram between the roll cage rods. Generally speaking, smaller is always better for your gimbal peripherals. • INTEGRATION WITH FREEFLY MōVI CONTROLLER: If you are using a MōVI controller, there is an integrated focus wheel built in, which can be very handy for certain shots. Only two systems offer integration at the moment: The Hocus Axis 1 and the Redrock MicroRemote. • RUN / STOP CONTROL: Allows you to run and stop the camera from the remote hand unit. • MULTIPLE CHANNELS: In the gimbal world, using zoom on a lens is not really an option, except in a few instances. But iris control is a huge plus and many remote lens control systems offer you up to three channels to control focus, iris, and zoom. • LENS MAPPING: Some lens control systems allow you to pre-program all your different lenses into the system, so that once you calibrate the lens, the digital display on the hand controller will tell you where your lens distance is at. • DIGITAL DISPLAY: Quickly see important information about your lens and focus, especially when lens mapping is an option – no more witness marks on your hand controller. • AUTOMATIC TORQUE: When calibrating a lens, the motor will actually detect the stiffness of the focus ring and adjust its torque accordingly. • MODULAR COMPONENTS: Attach an iris slider if needed, add a hand grip, reconfigure for left handed focus pullers, etc. 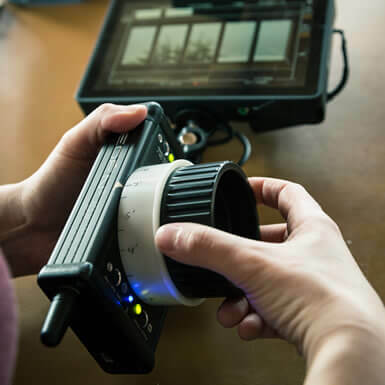 • CINE TAPE INTEGRATION: Some systems allow you to plug in Cine Tape or a similar product, which helps the focus puller estimate the distance a subject is from the camera, using ultra-sonic signals emitted from a small device mounted to the camera. There are many manufacturers of remote lens control systems out there, ranging in price from a low $1,760 for the Ikan PD1 up to well over $30,000 for a full feature Preston FI+Z system. So what do you get for that extra $28,000? Generally speaking, better accuracy, speed, range, and consistency. But $28,000 better? That’s hard to say. So to help you decide which brand and price point is right for you, I’m going to break down the major differences between the different brands that are relevant to gimbal operators. This is the most popular and most common system in the US market. It has been around for a long time and has a reputation for being extremely reliable and accurate. MY OPINION: 1st AC’s love the Preston, but it is a huge pain to rig the bulky base station to my gimbal camera package. The lens motors are also very bulky and heavy, which creates all sorts of problems on lenses that have long barrels, since adding weight way out front on the gimbal requires you to counter this weight on the back of the camera to balance the gimbal correctly. The performance and features are excellent, but the gimbal rigging is by far the most challenging of all the systems out there. 1st AC Michael Merriman carrying a fully rigged MōVI M15 on set of the feature film “The Sea of Trees”, complete with a Preston FI+Z remote lens control system. Cmotion has been around since 2002 and while it is not as widely known in the US as Preston, it is a very popular system in Europe and other non-US markets. It is a very reliable, accurate, feature-rich system. MY OPINION: This is by far my favorite system to use on my MōVI M15. It has all the features and performance of the Preston system, plus the base station is super compact and lightweight. In fact, the three channel base station is smaller than most single channel base stations out there. The motors are also fairly small and lightweight. Gimbal rigging is easy, performance is top notch. PROS: Small, lightweight system from a strong, reputable brand. Upgradeable from 1 channel to 3 channels. CONS: Relatively expensive system with way less features than its big brother, the Cvolution. Wireless range is limited. MY OPINION: This system has the potential of being very strong, but the short wireless range is a huge problem. In this price range, you would be way better off spending a little more on the Cvolution system. 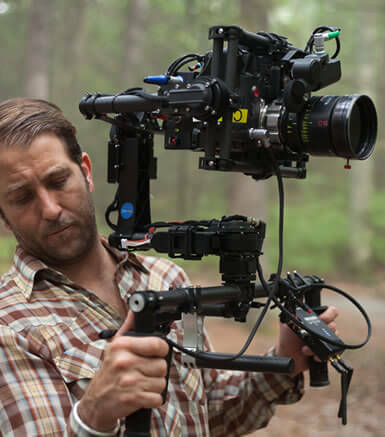 1st AC David Parson pulling focus for the feature film “The Sea of Trees” on a Cmotion Cvolution system. The Cmotion Cvolution Camin 3M (receiver) is a 3 channel system that is smaller and lighter than most single channel systems. It’s about the size of a pack of cards, making it easy to mount in small spaces. This company focuses heavily on precision components and high end performance. True to its British roots, it is often referred to as the “Rolls Royce” of remote lens control systems. PROS: Small, lightweight system. Excellent responsiveness, great accuracy, very reliable. Compact and lightweight base station. 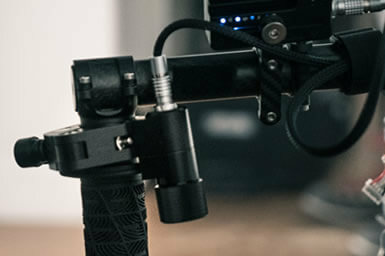 Integrates with the Freefly MōVI Controller. CONS: Only one channel is currently available. Does not offer many additional options such as lens mapping or Cine Tape integration. MY OPINION: This is the remote lens control system I use on most of my shoots and I love it. Despite the system being abused on a regular basis (rained on, dropped a few times, used in freezing temperatures, etc. ), it has never failed to operate perfectly. It does not have all the features of the Cmotion or Preston, but does have all the must-have features including a run/stop. It also costs way less. For a high-end professional remote lens control system, the Hocus Products Axis 1 by far offers the most value for the money. If you don’t have a 2 channel lens control system, you can always put two single channel systems on your rig. On this shoot in the DMZ of North / South Korea, we had the Hocus Axis 1 system controlling focus and the Redrock MicroRemote controlling iris. Very heavy setup, but very effective. Redrock Micro has been making quality camera support gear for shooters on a budget since 2004, primarily focusing on the DSLR market for the past several years. The MicroRemote lens control system offers good performance at a very reasonable price. For entry level remote lens control systems, this one by far offers the best value. 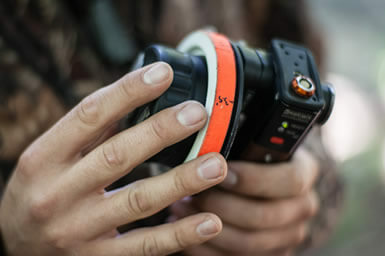 PROS: Very affordable, offers a thumb wheel focus control option for single operator, small and lightweight, excellent customer service, wireless range up to 1 mile, comes with ultra-thin flexible cables that work great for gimbal rigging, compatible with a range of more powerful digital motors such as Heden and Preston, integrates with the Freefly MōVI Controller. CONS:The lens motor doesn’t have the power or performance of the more expensive systems – sometimes it struggles with stickier lenses – but you can optionally use a more powerful digital motor if you need more power / torque. Hand controller feels a bit bulky. Single channel only. MY OPINION:For shoots that require me to pull my own focus while MōVI operating, this system is my go-to. 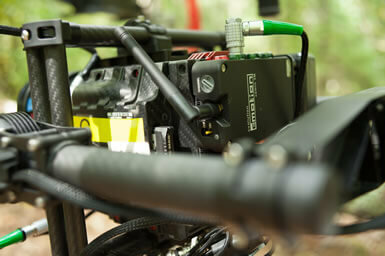 The motor is also super light, which is a huge benefit when working with larger camera packages. Overall, the quality of performance does not feel on par with a high end system like the Preston or Hocus Axis 1, but at a fraction of the price, it gets the job done very well at a great value. UPDATE: Redrock has sent me their new handheld controller which is smaller and less bulky than the previous one. Also it has new 3.0 firmware which Redrock says will make the feel a lot more professional. I haven’t had a chance to check this out yet, but that would be great news. Pulling your own focus as a MōVI Operator isn’t the ideal situation, but sometimes you have to. 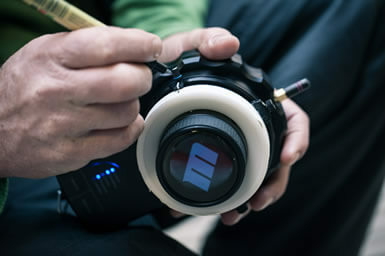 Redrock Micro’s focus thumb wheel puts the control in your hands… er, finger. The Redrock MicroRemote base station (receiver) is small and light, perfect for gimbals. Bartech has been manufacturing remote lens control systems for over 10 years and not long ago, was one of the few systems available under the $10k price range. PROS: Small, lightweight system. Good responsiveness, accuracy, and reliability. Compact and lightweight base station. Proven track record. Offers multiple channels and many add-on features. CONS: Remote control unit wheel has loose feel to it (pro or con depending on preference). MY OPINION: This is a great system at a good price. The only thing I don’t like about it is the feel of the hand control wheel, but that’s really a personal preference. Heden is best known manufacturing high performance lens control motors, some of the best in the industry. They recently began manufacturing full remote lens control systems at a very affordable price. MY OPINION: It’s surprising that a company which makes such amazing lens control motors also manufactures a hand unit that is of such low quality. It isn’t downright terrible, but at over $4,000 it definitely could be better. 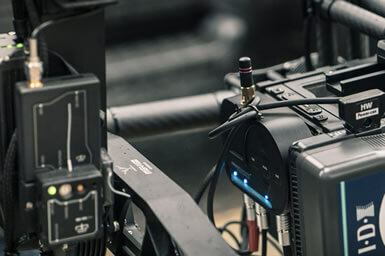 The bluetooth connectivity is a great concept, as it avoids radio interference that many of the other systems sometimes suffer from, but the bluetooth signal does drop from time to time which would be a huge problem on a shoot. The fact that the 9 volt battery required to power the hand unit dies after about 45 minutes of use is also a huge problem. 1st AC Alisa Tyrill pulls focus on a Heden Carat remote lens control system. Two years ago, there were only a few remote lens control options, now there are many options with more popping up all the time. Most of these new entrants seem to be in the low end of the market, offering price points well under $5,000 USD. Some of these may prove to be good performance at a good value, others may fall apart right out of the box. It’s important to understand that while on the surface, these systems look very simple and straightforward – a wheel controls another wheel that turns a gear remotely – seems pretty simple. But going back to the performance requirements of accuracy, speed, range, and consistency, these are not as simple pieces of gear as they seem. The way I see it, there are three different types of users of these product with very different needs, so choosing the right system depends on which of these users you are. If you are potentially looking for a career in focus pulling and want to sell yourself as a 1st AC to productions, you should get the highest end system you can afford and ideally, it would be the Cmotion or Preston brand. Preston is more popular in the US at the moment, but Cmotion has a very strong, positive reputation as well. Due to its compact size, light weight, extensive features, and exceptional performance, I recommend the Cmotion system hands-down for the very best in gimbal integration. In all likelihood, you will be able to capture a rental fee for your remote lens control system from production and that fee will correlate with the purchase price of your system, so you should see purchasing one of these systems as an investment that will make you money over time. 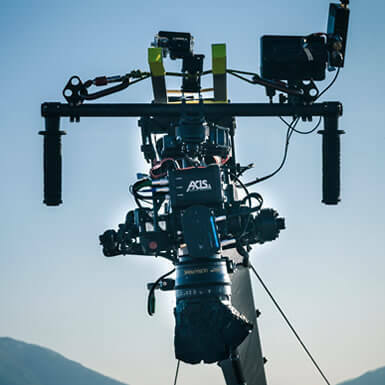 If you are a professional gimbal operator, you need to be able to offer a turn-key rental solution to productions, including a remote lens control system. In all likelihood, this will be a package deal and as a rule, productions will want you to give them the lowest price possible for your kit. Since you are probably competing with other gimbal operators for the job, you want your price to be competitive, which means you probably won’t get an optimal rental price for each item in your kit. So while a 1st AC gets hired for their skills as a focus puller and may be able to negotiate a premium rental price for their own remote lens control system stand-alone, your remote lens control system rental cost will get buried in the overall kit cost for your whole gimbal system. This means you will probably not get a premium rental price for your remote lens control system, so investing $20k+ in a top-of-the-line system may not pay off that well. However, you cannot outfit your high performance gimbal rig with a low performance remote lens control system. The Hocus Axis 1 system is the perfect solution – high end performance, solid basic features, mid-range price. I have yet to have a 1st AC complain about the system once they start using it, even the die-hard Preston users. They may complain about losing their Preston rental fee though, so be ready to apologize for that. If you want to spend as little money as possible on a reliable remote lens control system, absolutely go for the Redrock MicroRemote. It offers very good performance at a great value and has proven itself to be reliable since its introduction to the market two years ago. The thumb wheel control is a must-have if your production doesn’t have a dedicated focus puller. There are a few cheaper options now showing up on the market, but I am highly skeptical of their quality and reliability. Consider what the cost would be to even a small production if you had to stop shooting because you can no longer keep your subject in focus. I’ll bet the cost of having to stop your shoot and reschedule it due to an equipment failure greatly outweighs spending a few extra dollars on the Redrock MicroRemote system, so spend the extra money. You are buying confidence and avoiding stress, frustration, and humiliation on set – priceless. Being a professional gimbal operator requires you to not only master the MōVI, Defy, or whatever gimbal you choose, but you must become an expert in all the support peripherals as well, including wireless video systems, monitoring systems, and of course remote lens control systems. It’s a lot to learn and a lot to manage on set. It’s also a large monetary investment as you grow your gimbal operating career from the ground up. If you are a solid operator with a gimbal system that delivers great results to all your productions, you will inevitably get more and more work and see a return on your investment very quickly. If you buy cheap gear that performs inadequately or fails on set and creates problems for production, you probably won’t get a lot of work and will not see a quick return on the still sizable investment you made on your kit. So whether you need to dig a little deeper into your savings to get the right system, or perhaps find another operator or a local rental house you can rent gear from, make sure you get the right equipment for the job every time you work.